6" circle (4.5 " circle on Congress cloth). Opalescence is the fifth in a series called Parade of Pattern which features projects that explore common stitches in an uncommon way. In this design the OblongCross is used to create two tapered shapes that form an 8-pointed star. This is a versatile stitch since it can be used both as an upright and a diagonal unit. It can also be altered in scale to create endless variations. Two open variations are used here to form the two repeated points of the star. The bold diagonal pattern forms an interesting diamond trellis. The upright pattern is denser and tapers nicely without compensation to fit between the diagonal points. 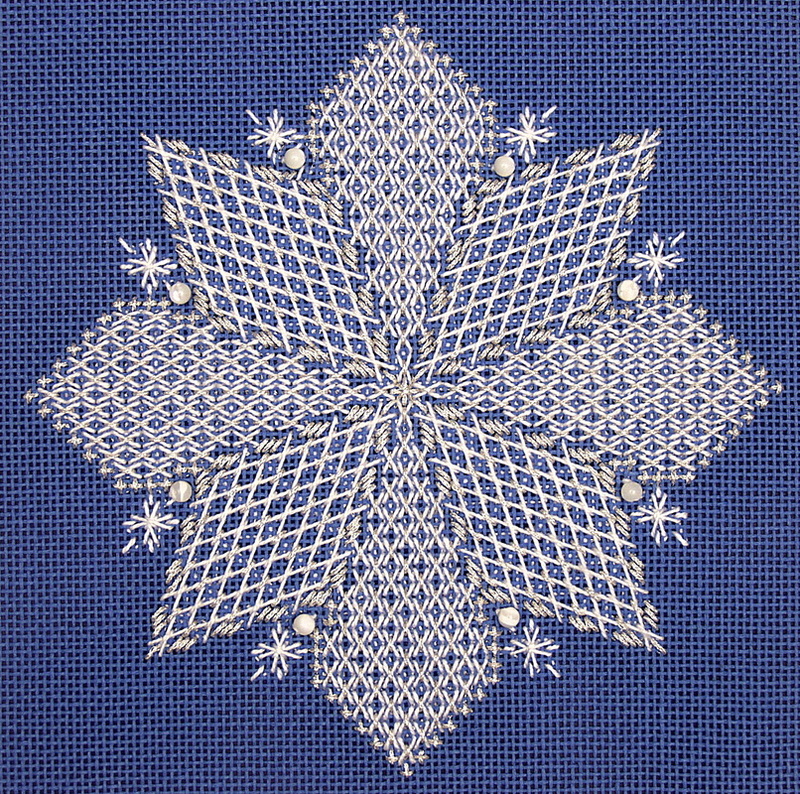 Additional silver accent stitches are added to these areas, and some Four-way Oblong Cross units and beads highlight the border indentations to further enhance the design. The high contrast of the white thread on a dark ground makes the design dramatic, but it would be equally effective in a different interpretation, using either a monochromatic treatment or a two-color treatment. NOTE. The design can also be adapted to a finer 24-mesh Congress cloth so thread substitutions for this are listed in parentheses below.